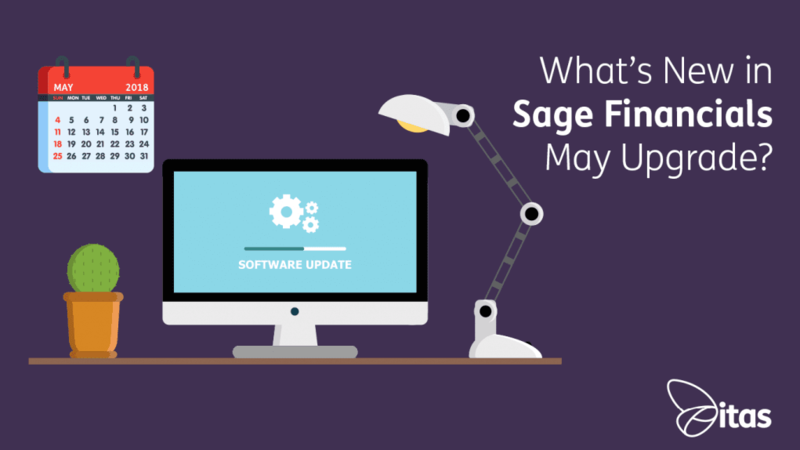 Sage Financials: What’s New in Sage Financials May Upgrade? Sage Financials: What’s New in Sage Financials May 2018 Upgrade? May has seen two bank holiday weekends and some wonderful weather, so as it draws to a close its okay to feel a little glum. Don’t panic though, we have another monthly Sage Financials Upgrade to cheer you up! This latest release sees a brand new Home Page, Reversing Journals, as well as a handy little ‘Current Company’ Tab in the bottom left. Here are our highlights from the the Sage Financials May Upgrade. As well as new reports, Sage have also introduced some useful quick links for the sales, purchases and banks area of the software. You can easily see your lists of overdue invoices, posts and news feeds. You also have access to your tasks lists and events. Once you’ve upgraded Sage Financials, you will be prompted to choose between the Financials home page or Salesforce home page. Each user is able to choose their own so whether you prefer to see your CRM summary or Financials summary first is up to you. It is now possible to reverse a manual ledger entry! To do this you can either manually reverse the ledger entry or use a scheduled job to set a specific time period or monthly date. So, you can now set a journal to automatically reverse itself next month! It is important to note that only Manual Adjustments can be reversed. They are ledger entries that have been creating in the Ledger Entries tab within Sage Financials. So if you have a Ledger Entry created using receipts, invoices or payments, this cannot be reversed. You can now set a default price book on a customer or supplier account in Sage Financials. This is useful for those who are using multiple price books and have different prices for subsets of your suppliers or customers. When creating an account or amending an existing one, you can now choose a price book. Journals and transactions can now have default tags set to them. Once the tag is set, it is then applied to the transaction or journal automatically. Related tags can also be set as the default tag which can then be applied to journals and transactions. This means that when you’re entering a transaction for suppliers or a customer, the default tag will automatically be applied. This should simplify the configuration and burden of entry! For example, you can set a related tag on the account that ensures the correct salesperson is recorded against every transaction that account is chosen on. Just make sure you specify the tag as fixed. On the required transactions types you can then set the tag as the default. Default tags can be updated at any time for any new transactions, overall saving time on data entry. Although stock valuation was introduced in April, the May upgrade see’s further enhancements to this. The method used for accounting for stock has been updated. After each sale or purchase of a stock item the ledger accounts are updated. Your inventory ledger account is where the value is posted for stock items that have been bought, causing an increase of stock value on the balance sheet. The cost of your sales are posted to your Cost of Good Sold and Inventory ledger accounts. This increases cost of sales on your Profit and Loss and decreases the value of stock on your Balance Sheet. N.B. To use this method, you must install an optional template regardless of if you’re a new or existing customer. Action buttons are now only visible when they can be used/applied. This should remove confusion on what is possible on what records. It is now easier to import journals and transactions thanks to the introduction of default feeds for invoices and expenses. When entering transactions you will notice a converted value details tab, so you can now see the conversion history on a transaction. While this upgrade is probably slightly smaller in scale then the previous upgrades we have been treated to, there are still some great new features. General usability of the system seems to be the focus of late. We can’t wait to see what else Sage have in store for us over the next few months. Tamara is the creative one. Her PC reflects her imaginative mind, colourful and with 2,857 tabs open in the browser. She’s the one who sits in the corner of the office busy working on our website. Even though she sits in silence, if she’s not in, our team is not complete. When she’s not at her desk clicking away on the web, she enjoys traveling, seeing the sights of the famous landmarks and using one of her many camera’s! Home » Sage Blog » Accounting software » Sage Financials: What’s New in Sage Financials May 2018 Upgrade?